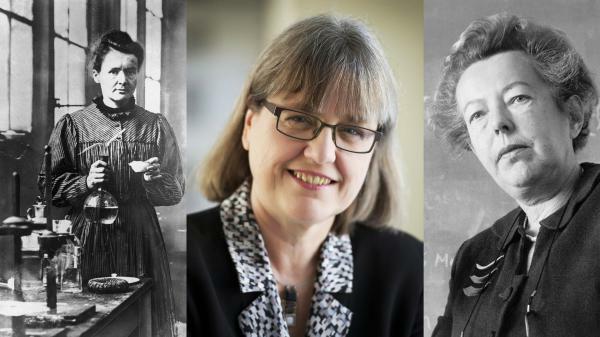 The Nobel Prize in Physics was awarded today to three researchers, including Donna Strickland. Strickland is the first woman to share the physics prize in 55 years. NPR's Geoff Brumfiel reports on what took so long. GEOFF BRUMFIEL, BYLINE: Even Donna Strickland herself seemed surprised at how few women have won the Nobel in physics. She was asked about it at a press conference earlier today. BRUMFIEL: It's true. There was Marie Curie in 1903, a nuclear physicist named Maria Goeppert Mayer in 1963 and now Strickland, a researcher at the University of Waterloo in Canada who won for her work on ultrafast, ultrabright laser pulses. Joanne Cole, a particle physicist at Brunel University London in the U.K., says the gender imbalance in physics exists well beyond the Nobel Prize. JOANNE COLE: Physics is traditionally one of those subjects that is viewed as being dominated by white, middle-class males. BRUMFIEL: She says the problem starts as early as elementary school, and it runs all the way through grad school. COLE: We've tried really hard to try and encourage more women into physics, but it just doesn't seem to be happening. BRUMFIEL: Here in the U.S., just 20 percent of advanced physics degrees go to women. That number hasn't changed in a decade. The field suffers from more explicit sexism as well. Just last week, a male physicist at a European lab gave a presentation claiming that men were better than women at physics. He was suspended. Other researchers in recent years have lost their jobs over sexual harassment. That's progress, says Jane Luu, an astronomer at MIT's Lincoln Laboratory. JANE LUU: I think that's the right direction, but it's different from being respected for one's expertise. LUU: I would have a grad student. And they were male because (laughter) I didn't have any female grad students. And I was always assumed to be the student, and the - my student was always assumed to be the person in charge of me. BRUMFIEL: Luu says she thinks that kind of bias contributes to why there are so few Nobel prizes awarded to women in physics. To get the prize, you have to be nominated by another physicist or astronomer, most of whom are men. LUU: I don't know what fraction, but there will be thousands of nominations for men and maybe, you know, like, five nominations for women. I don't know, something like that. GORAN HANSSON: It's a small percentage. That's for sure. BRUMFIEL: That's Goran Hansson, the secretary general of the Royal Swedish Academy of Sciences during today's press conference. He says the academy which runs the Nobel is trying to fix the problem. HANSSON: We're taking measures to encourage more nominations because we don't want to miss anyone. BRUMFIEL: Luu says the Nobels need to catch up with the times. Silicon Valley billionaires have begun financing a bunch of new prizes for physicists to win. Luu herself won one of the prizes, the Kavli Prize, in 2012. And she was in good company. LUU: The year I won there were four women. And that was pretty cool. BRUMFIEL: If the Nobels want to stay cool, Luu says, they need to make sure they're not overlooking good candidates who just happen to be women. Geoff Brumfiel, NPR News. Transcript provided by NPR, Copyright NPR.